War Wings Apk 3.0.36 : Take to the skies and join the battle in epic WWII dogfights! 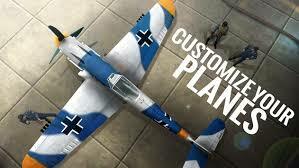 Climb into the cockpit of your fully customisable warplane and get ready for take-off – your mission is about to begin! Users now have the ability to change their nation flag and username. – New prop: Booster. Boosters can be used before you enter a battle to increase RP and Silver received during that battle. – Sync up with Facebook friends: Now players who log in via Facebook can sync up your friends and see who’s playing War Wings. You can directly chat or team up with them. – Fixed some bugs and improved optimization.